Tu, M. 2009. 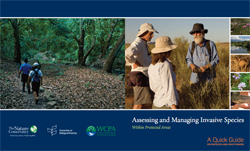 “Assessing and Managing Invasive Species within Protected Areas.” Protected Area Quick Guide Series. Editor, J. Ervin. Arlington, VA. The Nature Conservancy. 40 pp. One of the most severe threats to Protected Areas around the globe is invasive alien species (IAS). IAS are non-indigenous species that may spread quickly and aggressively when introduced by humans to areas beyond their normal ranges and can decrease native biodiversity and cause dramatic environmental changes. In fact, IAS are widely recognized as posing threats to biological diversity second only to direct habitat loss and fragmentation, and have been implicated in the decline of endangered species worldwide (Baillie et al. 2004; Wilson 1992). It is therefore imperative to address IAS threats to preserve the values and functions of Protected Areas, and the biological wealth and support they provide to the livelihoods of millions of people. In February 2004, 188 countries committed to the Convention on Biological Diversity’s “Programme of Work on Protected Areas,” an ambitious set of activities aimed at establishing and maintaining comprehensive, effectively managed, and ecologically representative national and regional Protected Area terrestrial systems by 2010 and marine systems by 2012. The CBD recognizes the importance of invasive alien species as a global issue and calls on contracting parties to “prevent the introduction of, control or eradicate those alien species which threaten ecosystems, habitats and species” (Article 8(h)). At the 2008 CBD Conference of the Parties (COP-9) in Bonn, Germany, a number of countries committed to specific invasive species prevention and control actions and funding. Provided that there is awareness, capacity and sustained resources, IAS threats to Protected Areas can be abated.